This drone footage was shot on October 12, 2017, using a DJI Mavic Pro. The man who shot this amazing video, James Reynolds, records Nature’s violent tantrums. His work often can be seen on CNN, TWC, Discovery, Nat Geo etc. With his words on his twitter account, he “reports from Nature’s extreme front lines, for jaw-dropping videos of Earth’s most violent natural forces”. Reynolds shot the eruption from a safe distance, about 2.5 kilometers (1.5 miles) from the crater. 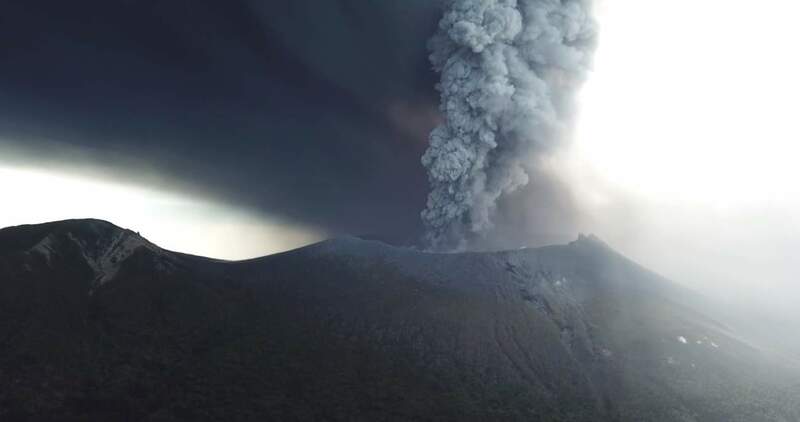 The plume of the smoke rose some 2,000 meters (5,600 feet) above the crater. For a comparison, the volcano’s height is 1,421 meters (4,662 feet) above the sea level. A small amount of volcanic ash fell in three cities and the town of Takaharu in Miyazaki. In Takaharu, some people walking about used umbrellas for protection from the ash. According to the Meteorological Agency of Japan, there were volcanic tremors had been intensifying in the area since late September. Believed to have formed between 7,300 and 25,000 years ago, Shinmoedake (Shinmoe-dake, means Shinmoe peak in English) is a volcano in Kagoshima Prefecture, Kyūshū, Japan, and a part of the Mount Kirishima cluster of volcanoes. The previously recorded eruptions were in 1716, 1717, 1771, 1822, 1959, 1991, 2008, 2009, and 2011. Aerial footage of the eruption of Shinmoedake. It is an active stratovolcano with a height of 1,421 m (4,662 ft) above sea level. A stratovolcano, also known as a composite volcano, is a conical volcano built up by many layers (strata) of hardened lava, tephra, pumice, and volcanic ash. Unlike shield volcanoes, which usually built almost entirely of fluid lava flows and named for their low profile, resembling a warrior’s shield lying on the ground, stratovolcanoes are characterized by a steep profile and periodic explosive eruptions and effusive eruptions. 2011 was a very active year for the volcano – it erupted many times starting from the January. One of the eruptions in 2011 was on March 13, two days after the 2011 Tōhoku earthquake, one of the most powerful and deadly earthquakes in the recorded history. Several hundred residents evacuated from the area because of the eruption. Shinmoedake was used as a location in 1967 James Bond film and the fifth spy film in the James Bond series, “You Only Live Twice”, as the volcano in which the villains’ secret rocket base is located.